Pick 3 Adorable Handmade luxury Velvet Scrunchie , please check the list for availability! Cute and Sweet 4 in. ponytail to hold up for your hair. wrapped in beautiful birthday / holiday paper and decorative tiny bow with adorable note card .add note to seller section and will add it on. Perfect items!! 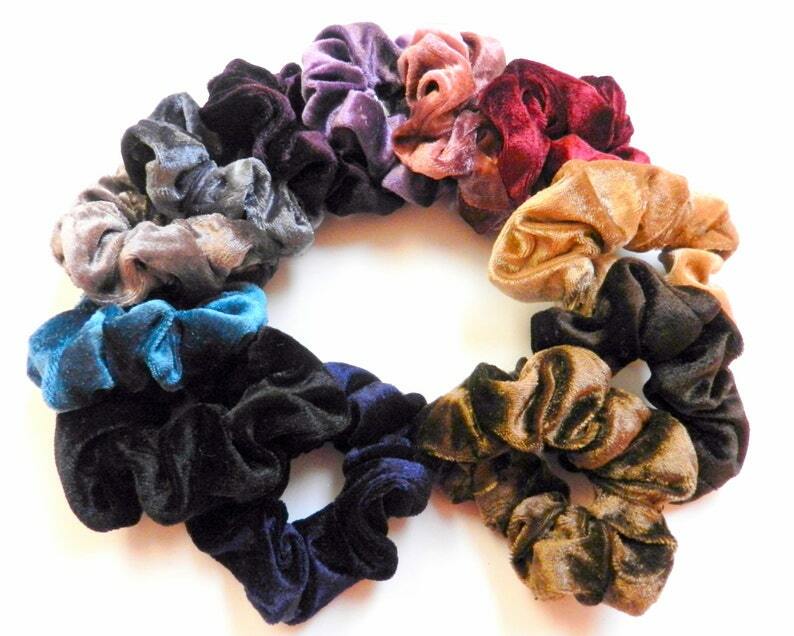 Have gotten many compliments on these scrunchies! Terrific shop!! I ship USPS First Class International. If your returning an item I need to receive it within a week from you receiving it, unused and in same condition you received it....You will be responsible for shipping cost sending it to me. All coustom made order are finally Sale, no return or exchange zone custom made designs. We would be happy to accept any returns within 14 days if the product was not worn or altered. , or repair any worn product within the warranty period. If you wish to return any item, please contact our sales [!at] shaileeboutique.com email and state your request and Order number. An RMA will be issued to you with shipping instructions for the return. shipping costs are not refunded and not subsidized. Once we receive the item, we will refund the cost of the item plus any taxes that may been associated with the purchase. I will do whatever I can to ensure you are a happy customer. If for any reason you feel that you cannot give me positive feedback, please convoy me first and I'm sure we can work it out..
Payment must be made at time of purchase. If you have any problems with payment, I will be happy to wait till the problem is solved. Just let me know what the issue is. I normally ship out items in 3 to 5 business days of receipt of cleared payment. If your adress is incorrect extra shipping will be request for reship package . All order with incorrect adress that's unavalible to purchase a shipping label by the system will be hold for 21 days, if no respond the order will be fully refunded and the transaction will be chandelled.